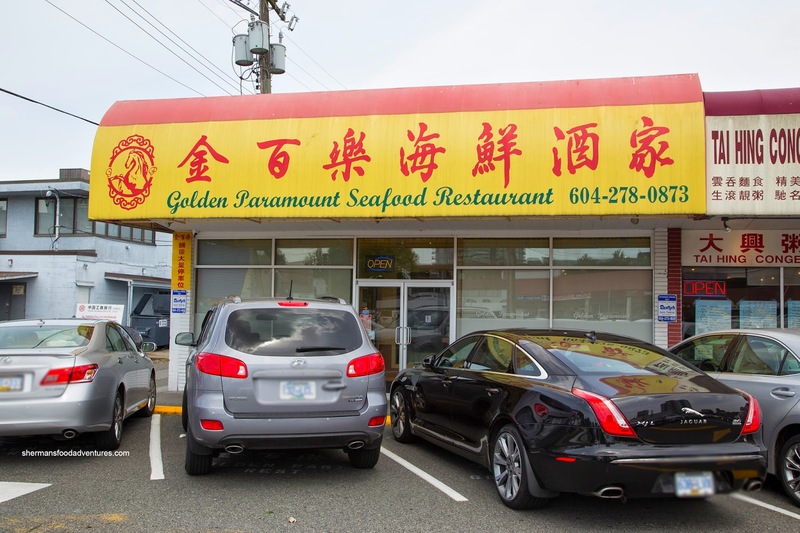 So anyways, to start things off, we decided to try out Golden Paramount. 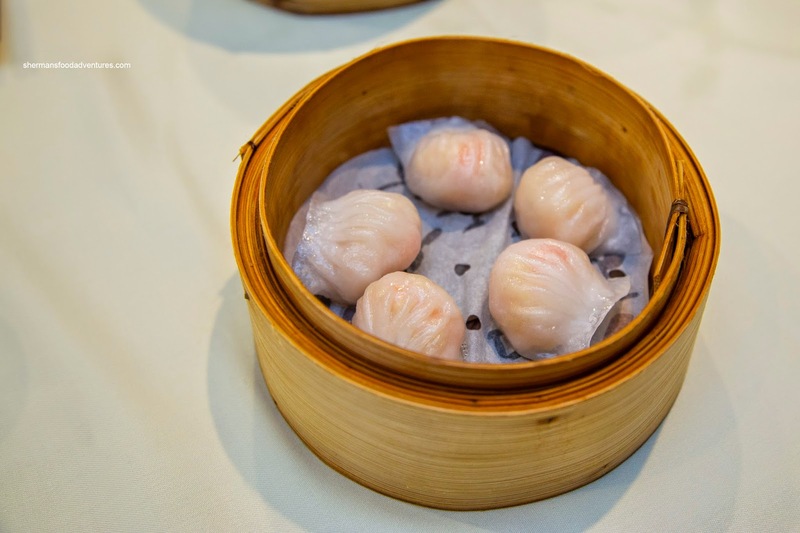 Our first dish was the Haw Gow (Shrimp Dumplings) which arrived as a set of 5. That was a good thing as they were rather small. 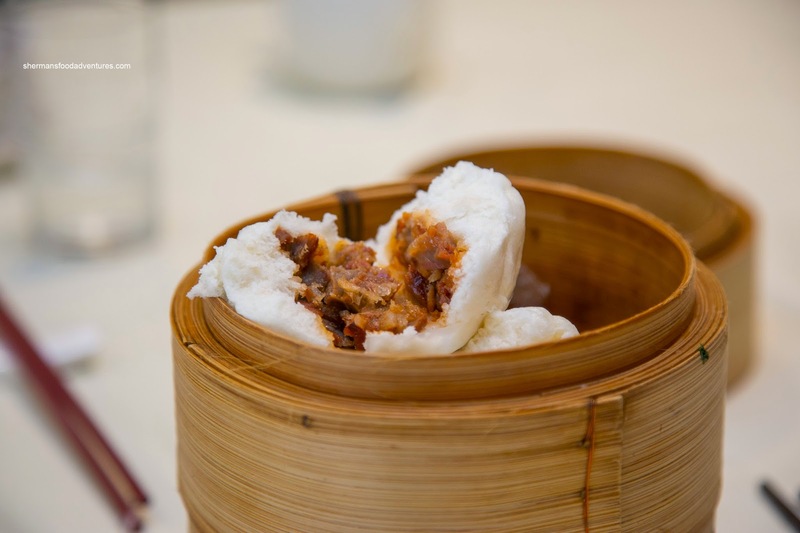 Yet, quality made up for the lack of quantity as the shrimp filling exhibited a buttery moist snap. Despite the over abundance of bamboo shoots, the flavour was neutral due to proper rinsing. Hence, there was an appealing sweetness with a hint of sesame oil. With 5 instead of 4, we should've known that they did things differently here. 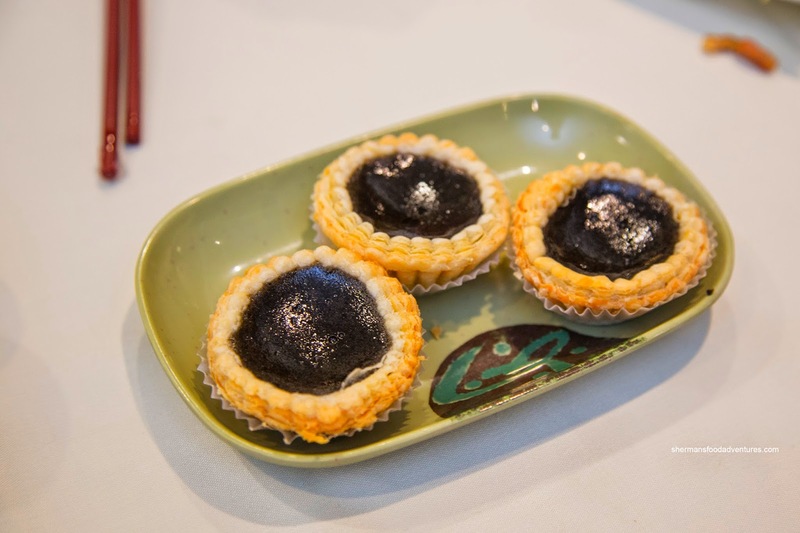 If that didn't tip us off, the Black Sesame Egg Tarts sure did. In an unattractive shade of dark black, the tarts ate much better than they looked. Flaky and butter, the tart shell was filled with a fairly dense custard that was plenty aromatic with black sesame. 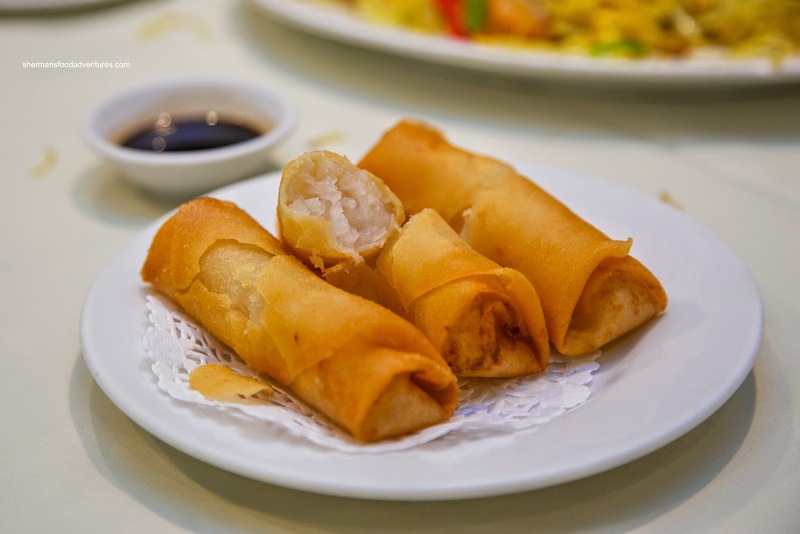 Continuing with the strange, we had the Spring Rolls filled only with shredded daikon. Although it was a disaster waiting to happen (moisture from the daikon), the spring rolls turned out okay. With a golden and crunchy exterior encasing tender slivers of well-seasoned daikon, it was much better than expected. With that being said, we were still longing for the shrimp version. 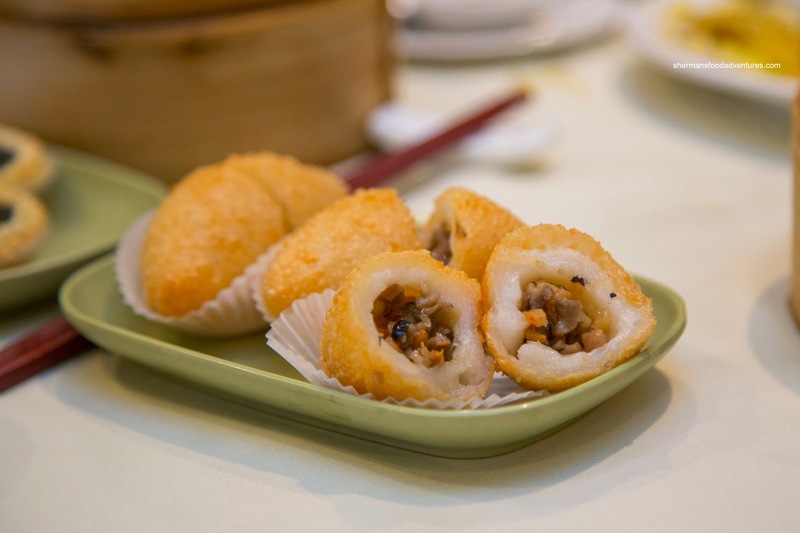 Moving onto another fried item, we tried the Fried Dumplings. 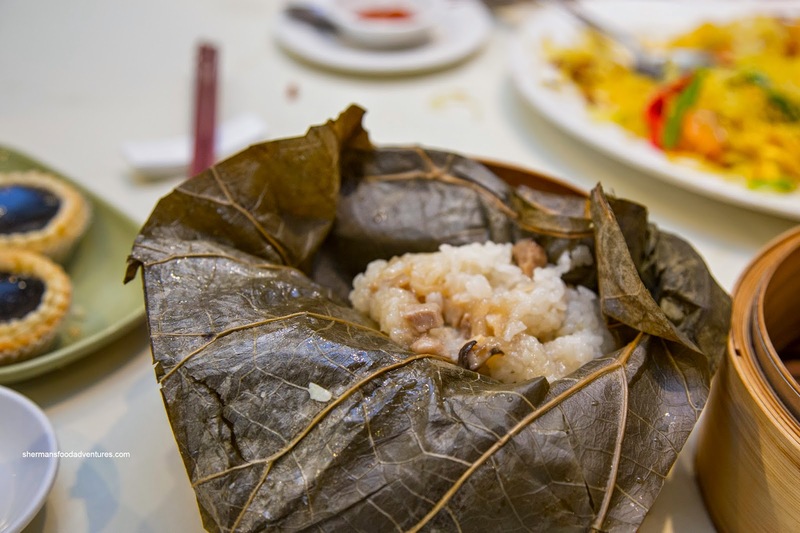 We found the glutinous rice shell to be just a bit too thick where it made it cumbersome to eat. However, the exterior was plenty crisp while there was an adequate amount of filling. 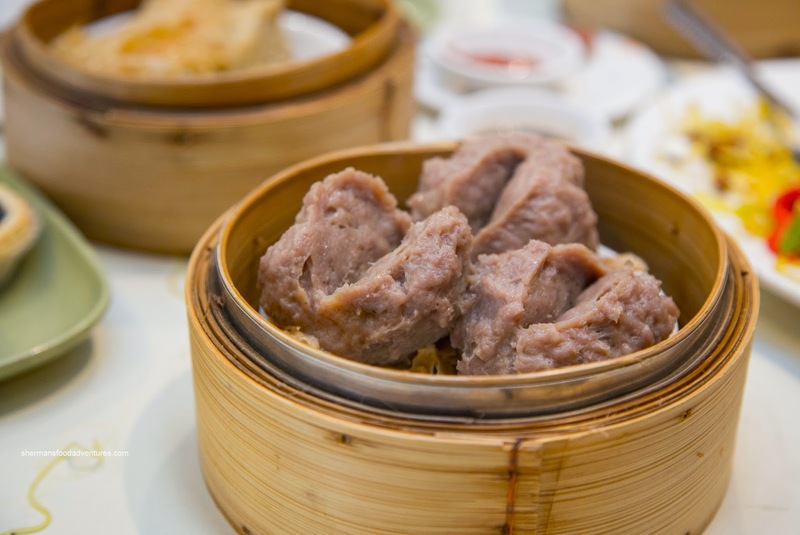 There was a noticeable dried shrimp flavour which overwhelmed most of the other ingredients. 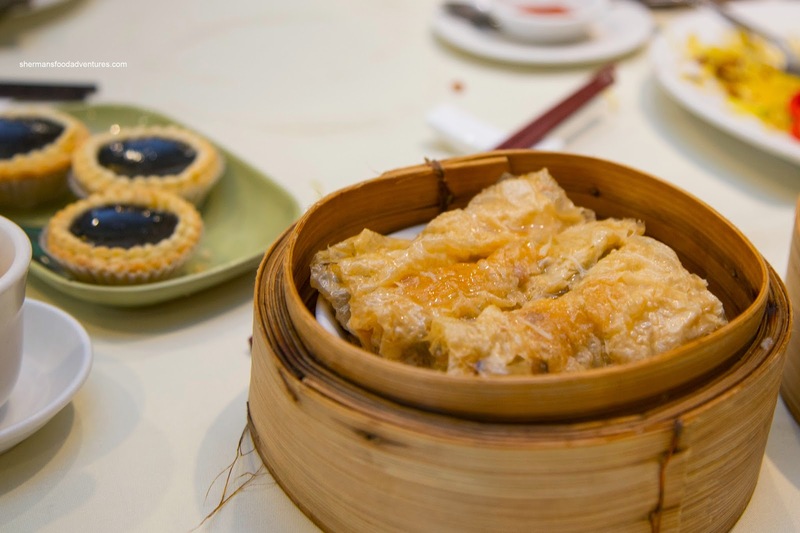 Yet another interesting take on a Dim Sum classic was the Bean Curd Skin Rolls. 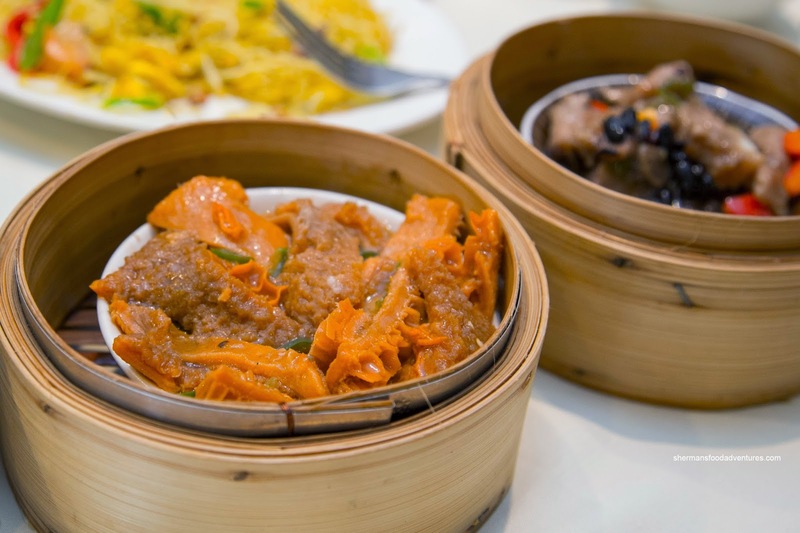 Typically, these are filled with ground pork and an array of ingredients such as wood ear mushroom, bamboo shoots, shrimp, shiitake and/or carrots. For this one, it was a bunch of loose ground pork with a bevy of celery. Therefore, the texture was very off while the dominant flavour was of celery. We didn't like this very much. Talk about different, even their Beef Meatballs were a little strange to look at. It was mainly just processed beef without any greens (such as cilantro or green onion). Not aesthetically-pleasing nor diverse in flavour except for some notes of dried orange peel. Texturally it was good though with a nice rebound. 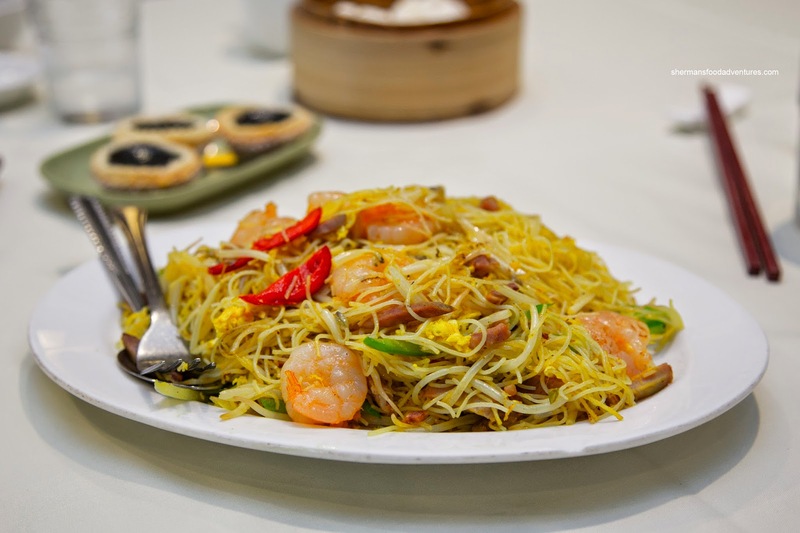 We ended up getting an order of the Singapore Fried Noodles to make sure we filled our bellies. Turns out that we needed to order more food since the portion size was miniscule considering the nearly $15.00 price tag. But just like the haw gow, quality reigned supreme. As you can clearly see, there was more ingredients than noodles (and why couldn't they have just added more noodles???). Lots of lean BBQ pork, crunchy shrimp and crisp veggies accenting the chewy well-seasoned noodles. 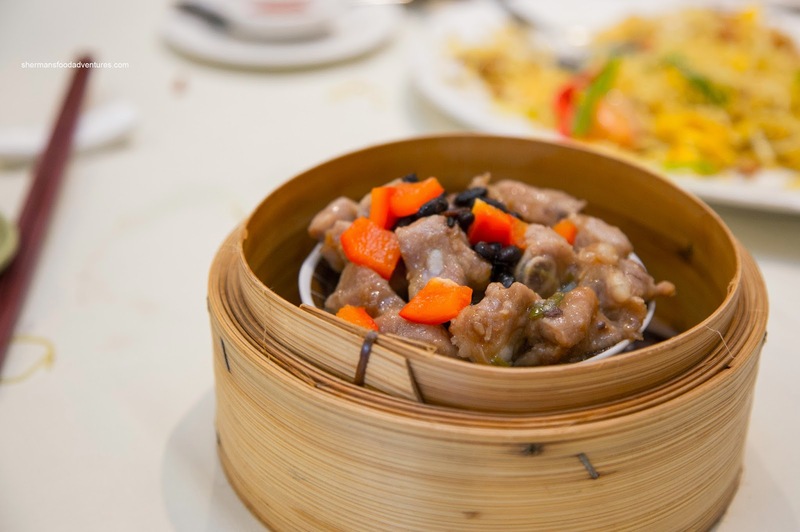 Our order of Steamed Black Bean Spareribs looked a little dark, yet in the end, the flavours were okay being predominantly salty without any garlic. The meat was somewhat bouncy and chewy where cartilage and fat was kept to a minimum. Of course I had to get my order of offal in the Steamed Tripe with dried scallop sauce. With alternating pieces of honeycomb tripe which were in different shades of brown, the dish really did have a particular flavour. I wasn't convinced that the "scallop sauce" went well with the tripe. It was a combination of gamy with seafoody... The tripe was tender though with a slight chew. 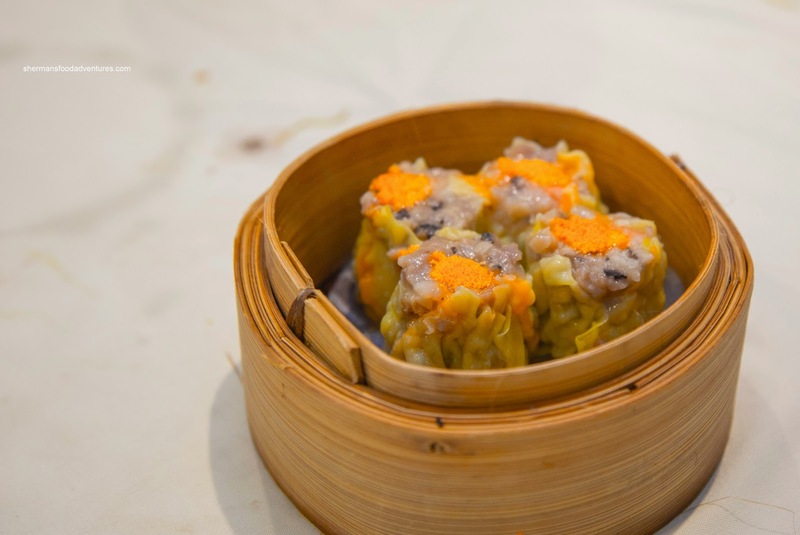 Lastly, we had the Sui Mai, which were pretty small. One bite and wow, the darn things were at least 50% comprised of shiitake mushrooms. Great flavour, but it completely dominated the profile of the dumpling. Even though the textures were bouncy, the flavours were not in balance. As you can probably ascertain, our experience here was different - sometimes good, other times were a bit strange. Their Chinese name, translated, is Golden Park Lock. Any idea if these folks were behind the original Park Lock (RIP) in Chinatown ? And if Golden Park Here and Lock merged with Come Along, they'd be Golden Come Along, Park Here and Lock !